DESCRIPTION: Aunt Betty's Cottage offers a perfect blend of comfort and value for today's savvy traveler. This charming little bungalow was recently updated and features a thoughtfully planned, open layout, and is decorated throughout with stylish touches. Situated in Bar Harbor's village of Town Hill, the locale is the perfect starting point for exploration of Mount Desert Island's treasures. It's within walking distance to some wonderful amenities such as the Town Hill Playground, the Town Hill Market with its great baked goods and ice cream, The Atlantic Brewing Company and to an Island Explorer bus stop. You will find Acadia National Park's main entrance just six miles down the road and the villages of Bar Harbor, Southwest Harbor and Northeast Harbor are nine miles or less. 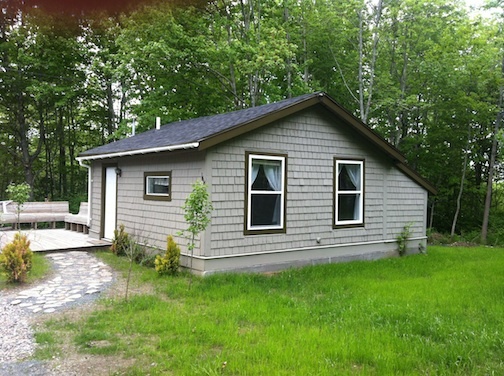 Please note that Aunt Betty's Cottage is a Sunday to Sunday rental and it shares a driveway and deck with the main cottage. LAYOUT: Small entry leads to cheerful and bright kitchen/living area. Counter height dining table seats 2 - 4. Bedroom with queen bed. Bathroom with shower. Laundry room with washer and dryer. Additional sleeping for 1more on a stow able twin bed. $600 p/month + cable, internet, phone, propane heat, plowing, trash. Pet ok w/approval. Linens/towels NOT included.